SPAM in Hawaii. It's a passion! No, I'm not talking about annoying e-mail messages. I'm talking about that pink block of salty preserved meat produced by Hormel Foods and known as SPAM. It's a treat meat that's been around long before the internet. While many people label it as a strange mystery meat, according to their official website, SPAM includes just a few simple ingredients. Ground pork from the ham areas, salt, water, potato starch, sugar, and sodium nitrite are the extent of the ingredients. The ingredients are mixed according to their secret formula, packed into the signature rectangular container, and a brand new can of SPAM is born. Basically, it's kind of like a hot dog (though I'd argue that it's far superior), but in cube shape. It's salty, porky, greasy, and highly addictive. It was in 1937 when Hormel Foods first introduced SPAM to the world. Just a few years later, World War II began, and SPAM, with its long-lasting capabilities, was shipped to various US military stations. Hawaii happened to be one of those stations where SPAM was provided in bulk quantity. With little to eat but SPAM, the protein rich salty meat soon became a local favorite. Not only GI's were enjoying it, but the entire island began to grow fond of it. After WWII ended, Hawaii still clung to the comforts of their precious SPAM, which not only provided nutrients in a time of need, but also tasted remarkably delicious. Today, SPAM is as popular as it's ever been in Hawaii. So popular in fact, that it's available as a breakfast meal combo dish at McDonald's. There are a number of different ways that SPAM is prepared in Hawaii. One of the most common ways, and one of my favorites, is just fried in slices, and served over rice along with a fried egg. A few squirts of soy sauce over the rice makes it a winning combination to start the day. SPAM fried rice and SPAM sandwiches are also common. 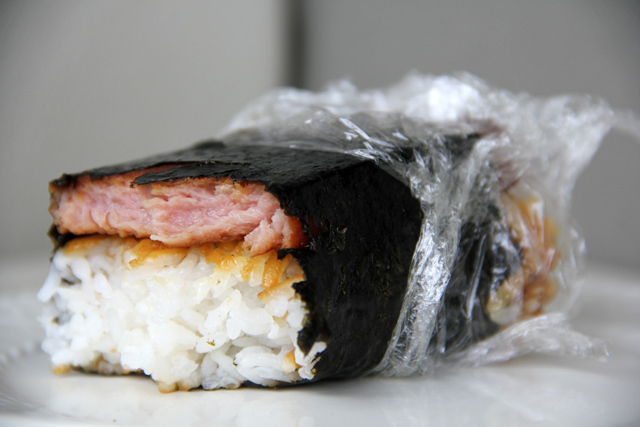 There are many SPAM dishes to choose from, but one of the most well-known treats in Hawaii is the SPAM musubi. A flaky sheet of seaweed padded down with perfectly cooked rice makes the first layer. Next comes a fried slice of SPAM (which some people even go as far as marinating prior to frying) before the seaweed is wrapped over the creation and firmly pressed into a little brick. The result is the Hawaiian version of a sandwich, a rich Hawaiian fusion of Japanese food and SPAM all in one. Nowadays, SPAM musubi can be found at nearly every convenience store and family shop in Hawaii. While previously there was only a single flavor of SPAM Classic, the advances of additional versions and flavors has been a wonderful development. Black pepper, jalapeno, cheese, and bacon are a few of the recent flavor additions. However, in my opinion, nothing compares to SPAM Hot and Spicy – the same meat infused with Tabasco hot sauce. After tasting the hot and spicy version, I simply can't go back to the classic. 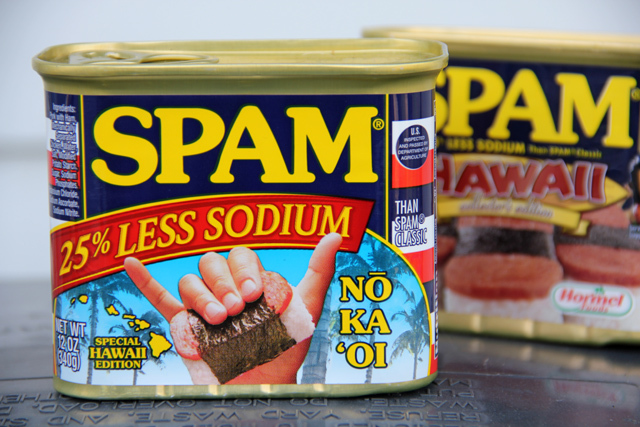 When you're in Hawaii, don't miss out on the wonderful treats created with SPAM! Eww. The thought of eating spam makes me cringe. If I ever make it there I will have to try the rice & seaweed sandwich, but it will be difficult lol.